Oklahoma City Thunder Plane Lands With Surprise Damage, Shaken Athletes : The Two-Way A Delta spokeswoman said a bird is the likely culprit for the caved-in nose of the plane, although crews are still investigating. 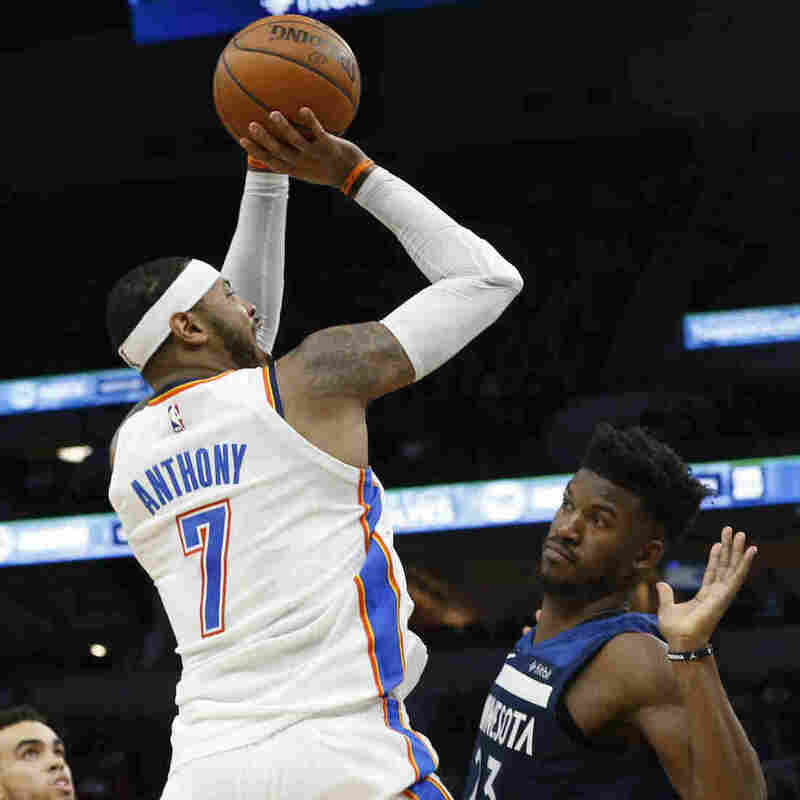 Oklahoma City Thunder's Carmelo Anthony shoots over Minnesota Timberwolves' Jimmy Butler during a game Friday in Minneapolis. The Thunder had a rocky flight to Chicago after the game. "What possibly could we have hit in the SKY at this time of night?" Carmelo Anthony posted to Instagram. A team official told ESPN that while Delta Flight 8935 was a little rocky, it was nothing out of the ordinary. But center Steven Adams called it "a rough flight to say the least." He tweeted at NASA, astrophysicist Neil deGrasse Tyson and scientist Bill Nye seeking answers about what could have caused the damage. Small forward Josh Huestis tweeted, "I guess we hit something?" Delta spokeswoman Elizabeth Wolf told NPR that although crews are still investigating, the "something" was likely a bird, a common culprit in midair collisions. She added the plane "sustained damage to its nose cone while on descent into Chicago." Airplanes have been having unwelcome encounters with wildlife ever since man sent its own winged craft into the sky. Orville Wright's plane hit a bird over an Ohio cornfield in 1905, an incident he wrote about in his diary. The Bird Strike Committee USA, a data-tracking organization that serves the airline industry, says more than 20,000 wildlife strikes are reported each year in the U.S. alone. The vast majority involve birds, although bats and reptiles and mammals that have wandered onto runways have also been involved. Usually wildlife collisions are not fatal, although they have killed some 250 people worldwide since 1988, says the group. The Federal Aviation Administration says most collisions occur during the fall when young birds leave the nest and the cold drives migration toward warmer climates. The FAA says damage to planes from the strikes could be as high as nearly a billion dollars a year. Airports — where most of the collisions occur — can reduce the risk, the FAA says, by implementing wildlife management programs, such as by removing plants hospitable to wildlife. Around a century after the Wright flight, the perhaps best-known bird collision led to the "Miracle on the Hudson." On Jan. 15, 2009, US Airways Flight 1549 collided with a flock of Canada geese after taking off from New York's LaGuardia Airport, resulting in two disabled engines. Captain Chesley "Sully" Sullenberger guided the plane onto the icy waters around New York City, leading to the safe disembarkment of all 155 people onboard. On Saturday, a spokesperson for the Thunder told The Oklahoman that all players, staff and coaches were just fine upon their arrival in Chicago. The team is taking on the Chicago Bulls on Saturday night at the United Center.